It’s no surprise that when you put the word “marine” in front of an item, it raises the price. When it comes to stereos, the biggest difference is that marine units are rain proof, splash proof or water resistant. The circuit boards on these units are dipped in a plastic coating to protect the copper from corrosion and humidity. They are also made from UV-resistant materials so the plastic doesn't break down as quickly. Truly waterproof stereos contain all of these elements, but as an added bonus, are completely sealed. Typically they have a larger face plate to overlap the cut out which allows for a rubber gasket to seal it to the mounting surface. Some marine decks go further to differentiate themselves from car decks by having bigger buttons to operate while underway. They are also more intuitive and easier to operate. 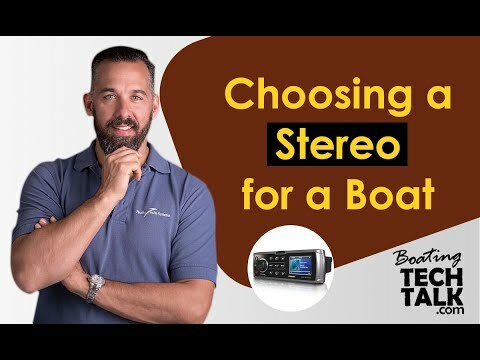 Marine stereos are usually installed in the dash of smaller boats or in the cabin on larger boats, they must be always mounted horizontally, keeping in mind that some units can weigh a couple of pounds and must be reinforced if the fibreglass or paneling is less than 0.63 centimetres thick. Marine stereos often have a cubby hole built-in for stowing smartphoes or mp3 players out of the elements. Wiring Each new stereo comes with a wiring harness that has two separate power wires, one is a direct power wire that connects to a positive unswitched terminal and it is important to have this connection always connected to power otherwise the settings in the stereo will be lost every time the unit loses power. The other is a switched power wire which can be connected to the ignition so the deck will turn off when the boat is also turned off. Actually connecting the ignition wire back to a key ignition switch might be more hassle than it’s worth. Instead you can wire the ignition wire to the on/off circuit breaker to turn off the stereo at the DC panel. Another option is to simply connect the ignition wire to the main DC switched positive. With either option, use the power button commonly found on the unit to turn the unit on or off. A note about fusing. Make sure that there are fuses protecting the line powering the stereo. The stereo itself will most likely have fuses at or near the deck to protect it. But you also need to install fuses at the beginning of the circuit, closest to the connected power source as possible. For better performance and easier troubleshooting later on, power the unit with a wire that can easily handle the expected load. Then fuse the wire with an appropriate fuse, for instance a gauge 14 wire would need a 15-amp fuse. There is also a ground wire that connects to the negative terminal on the negative distribution at the panel. Included in the wiring harness is the speaker wire connection, each speaker requires two wires and most units can handle four speakers. Standard stereo head units have four amplified outputs, also called channels. You don't have to use all four channels but we do not recommend putting more than one speaker per channel. If you are not using all of the channels on the unit, you can install heat shrink or rescue tape over the bare ends. Different manufacturers use different plugs so keep this in mind if you are replacing a stereo. The wires are colour-coded so ensure you have a wiring diagram before you start the installation. Also, don’t assume that your existing speaker wiring is adequate, we use tinned 14-gauge wire while most installs use untinned 18-gauge wire. Untinned wire is a problem because it will corrode over time. The larger the wire gauge the better. In North America, as wire size diameter increases the numbering identifier decreases. Marine speakers come in two forms, flush mount or box, and are available at three different price points. Dual cone speakers deliver a limited range of frequencies and are the least expensive, coaxial speakers are the mid-range speaker and provide low to high range frequencies and component speakers produce the highest quality sound and have the highest price tag. If you are looking for more bass, the low frequency noise as opposed to the treble, or high frequency noise, then you may want to also add a subwoofer. A good coaxial speaker will cover the range of 20 to 20,000 hertz, the same range as human hearing. If you purchase a speaker that performs well in this bass range, you may not require a sub-woofer. If space is at a premium, it is worth looking at a speaker that is capable of multi-tasking. Also, look for a speaker with magnetic shielding which will allow you to install the speakers closer to your navigation equipment. If you have an older system that you want to keep, inspect the wiring and replace any that is corroded or shows sign of wear. Another suggestion is to spend a bit of time with the owner’s manual and fine tune the bass, treble, and settings. Most of these manuals are now available on-line. As discussed above, if your battery has been disconnected, the stereo pre-sets may have returned to the factory settings. As with all stereo units, these small tweaks can make a huge difference. Stereo Options One of the most popular stereos we install is the Fusion 700 series. They are designed specifically for the marine environment, are NMEA 2000 certified, Ethernet ready, use Bluetooth technology and are iProduct/Android compatible for wireless remote control. The unit will operate up to four different zones for volume control only. The 700 series has a front door that allows you to place your iProduct inside the unit to protect it from the elements. Unfortunately, there were some issues with some iProducts overheating and shutting down. Fusion now offers a universal dock unit to play content from any device, be it requires an Android smartphone or the iPhone 5 with a lightning connector. Also a note regarding the 700 series DVD units, the video out is composite only which results in an average image quality. There are a lot of really cool entertainment options available in the marine industry. 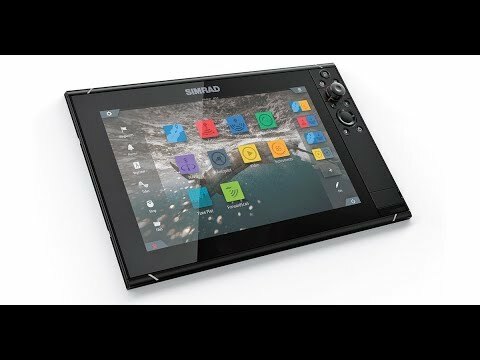 Companies like Lowrance, Raymarine, Furuno and Garmin are now integrating music and video with their multi-function displays. As always, decide how you are going to use your electronics before you spend money on options you may not use. Marine head units are expensive but they do include more protection from water corrosion. We have some clients who choose to play music on a small portable Bose unit via iProduct or Bluetooth. These units can be plugged into a small cigarette style inverter at only two or three amps at low volume. There are other units that use rechargeable batteries or even solar if you want to completely eliminate the draw on your batteries. These units are also great for background music if you are having a few people on your boat and the cockpit speakers are close to the seating area.